The River Palettes are an attempt to define and classify the richness of nature, imposing a human element in the midst of our environment, and commenting on our frequent attempts to codify and simplify natural systems of immense complexity. Drawing from 193 video clips documenting different parts of the Russian River watershed, each showing a different aspect of water flows and reflections, still images are exported which freeze the dynamic River in time. These are run through software which provides the top 5 colors present in the image, producing their Pantone Matching System number. 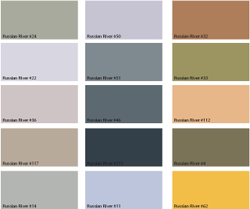 Each of these colors is entered into a database as it is 'discovered' and given a Russian River reference number. The colors are then named, in a conceptual gesture that combines the absurdity of corporate color-naming as employed by J. Crew and Martha Stewart with an artist and natural historian's genuine attempt to observe, document and classify his surroundings. The eight example palettes below are drawn from a recent project on the Russian River, each paired with their source video. For the gallery installation, they were printed on the back of half-inch plexiglas, and paired with an identically sized HD video player looping the video. [Video of the gallery installation]. I WANT COLOR PALETTES FOR MY LANDSCAPE!